We are pleased to present to you the capital of Ukraine - Kiev. The world has other cities that are older, bigger, richer, smarter and more comfortable. But Kyiv is beatiful and unique in its own way. The city's natural landscape with the boudless expanses of the Dnieper is in itself remarkable picturesque. The architectural ambience of the city has been built up over fifteen centuries of construction. Set amidst the natural landscape, the city's architectural masterpieces create a unique impression. Many historic monuments are preserved in Kyiv. These memorials remind us of the outstanding Kyivans who made their city famous throughout all the continents. Kyiv's location was preordained by nature itself for a unique settlement. The city arose of the frontier between the forest and forest-steppe zones, in a place where trade between tribes was lively. The city is cituated on the river Dnieper - one of the most important navigation arteries in Europe, part of the ancient trade route "from the Varangians the the Greeks". It is also the place where the Desna river flows into the Dnieper. The landscape consists of a series of elevations intersected by streams and ravines, which create secure natural fortifications. The legend about the founding of Kiev tells: "And there were three brothers: one known as Kiy, the second - Scheck, and the third - Khoriv; and their sister was Lybid. Kiy settled on the mountain that is now the Borichev Slope; Scheck settled on the mountain now known as Scheckavitsa; and Khoriv lived on the mountain now known as Khorevitsa. They built a town, and they called it Kyiv afer the oldest brother. The forest round the town was big and there were a lot of animals. Those men were wise and clever, and their people were called the Polians." This is the starting point of the history of the city on the Dnieper-Slavutich - the acknowledged spiritual center of Rus, Ukraine and the eastern Slavs. Unfortunately, Kyiv's virtues constantly attracted the predatory attention of invaders. It is difficult to name any other European capital that has been conquered and destroyed so often. But after every defeat, Kyiv rose even more beatiful - like a Phoenix from the ashes. Today Kyiv is the capital of Ukraine, a sovereign state belonging to the UN and the Council of Europe. Kyiv has a populaion of more than 2.6 million people. It occupies an area of 827 square kilometers. 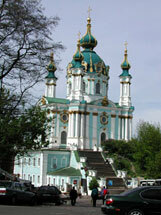 Every day Kyiv receives numerous visitors eager to see it's shrines and architectural ensembles. museums and parks, theatres and stadiums. Whether the chestnuts are in bloom or the lindens are fragran, whether the trees are painted in autumn colors or snow covers the roofs and hills - the city on the Dnieper is always beatiful and ready to greet you hospitably.